Hello! 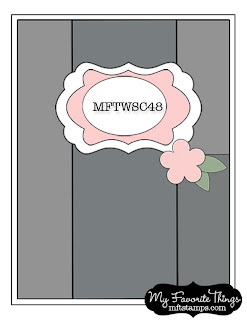 Thank you for stopping by and for all the kind words on my first MFT teaser post (below). I really appreciate your support and encouragement! It's time for a brand new CR84FN Challenge! Please note that CR84FN44 will last for just a week (ending on December 9th) and we will be taking a short break until January 1st. 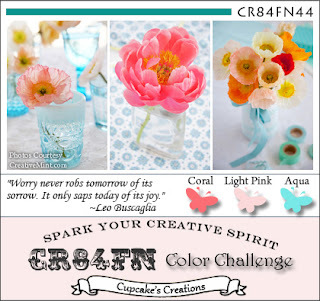 Our color palette is Coral, Light Pink, Aqua. Photos courtesy of Leslie at A Creative Mint. 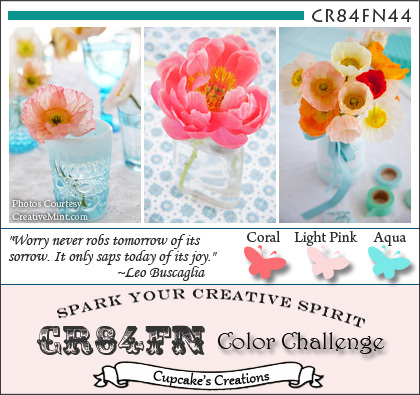 The colors made me think happy thoughts, so I pulled out All Smiles and used one of the many happy sentiments in it! I needed a birthday card for the school psychologist, and this is what I came up with for her. For sketch inspiration, I used this week's WSC Getting Sketchy #48 from My Favorite Things. All the challenge details can be found HERE. Thanks so much for stopping by! I will be back with another MFT Teaser tomorrow! Accessories: Die-namics Layered Label Die, Die-namics Bracket Edge Die (My Favorite Things); Crochet flower, Swarovski crystals, Button, Twine (My Mind's Eye), Foam tape, Thread, Sewing machine. Congrats again on your MFT guest spot. Fabulous job. Such a lovely card and such a darling sentiment. Sweet and lovely card! The paper with the mini rosebuds is beautiful. Lovely sentiment and sweet card for your school psych. Very lovely card. I love the saying. Stephanie! This card is nothing short of AMAZING! Love it girl! What a great take on the challenge colors! LOVE this! The little crocheted flower is the perfect touch! This is delightful Stephanie! Love that sweet crocheted blossom! Stephanie, LOVE the crocheted flower and the twine and the notebook paper (perfect for the school psychologist!) Just a Beautiful card! How pretty! Fab use of the sketch, love the sweet crochet trim flower! So very pretty! 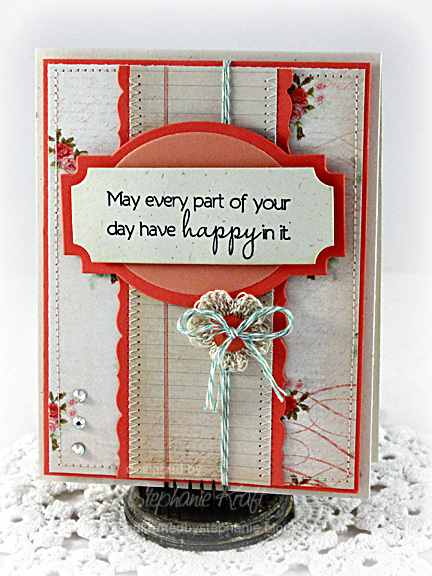 Lovely papers, gorgeous stitched details, the crocheted flower is so sweet and I love the sentiment! Just fabulous! And I'm so sorry to be so late commenting! Beautiful and very ellegant card with a really true sentence on it. I like it!